While we have no shortage of rough and tumble boy activities here at Small Potatoes, I sometimes forget to tap into my girlie side! Being a tomboy growing up, I was quite happy to make mud pies, run races, and scale the jungle gym with the boys. But I still loved girl things…Barbies, baby dolls, and my Fisher-Price doll house. 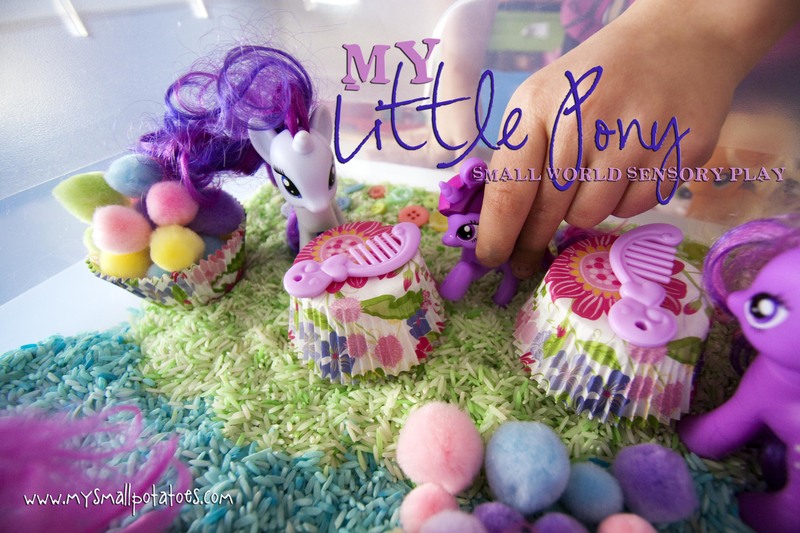 And I’m pretty sure I would have LOVED My Little Ponies, had they been invented way back in the old days! My girls have all enjoyed them. And now that I have 3 little girl toddlers in my home everyday, I figured it was time. It was time for a girlie bin. I started out with coloured rice. Pink and Green Mama has great instructions if you don’t already know how to do this. My 7 year old daughter helped choose the colours. 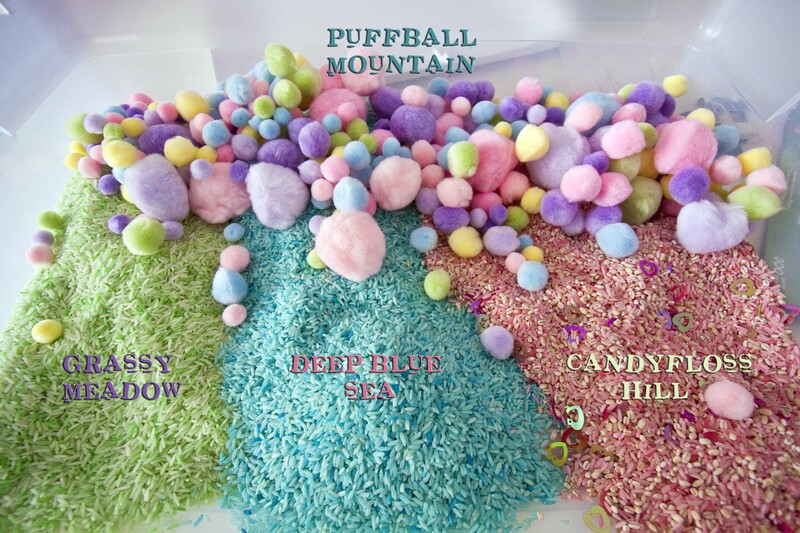 I added pompoms for extra colour and softness. I put the rice in the bin in sections, knowing full well, it would not last. By the end of the day it was a mishmash of colour but it still looked beautiful. You’ll notice our candy floss pink has some sparkly hearts in it. This is because we “borrowed” from our Valentine’s bin from February. We like to re-use our resources here…it’s more cost-effective. Now we can add our ponies! 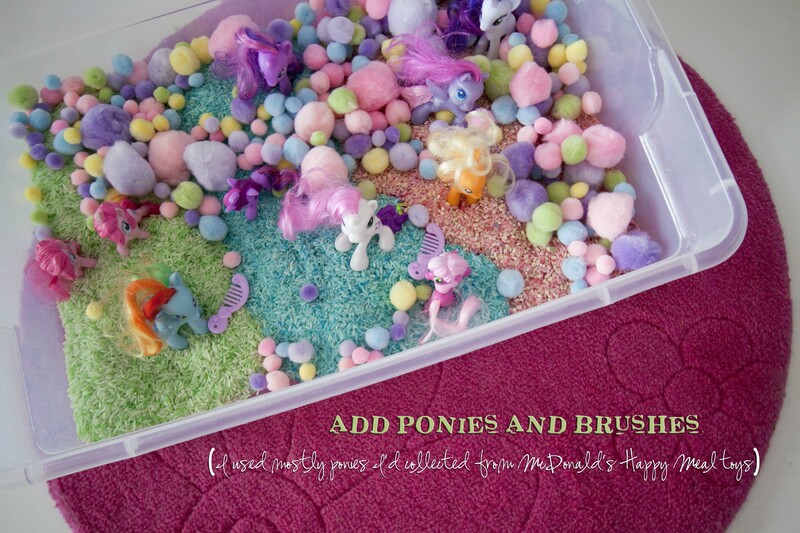 Every time McDonald’s has the My Little Pony toys in their Happy Meals, I sneak thru the drive-thru once in a while, buy a diet soda and a whole whack of the ponies. They are just the right size, and they are just the right price for me! 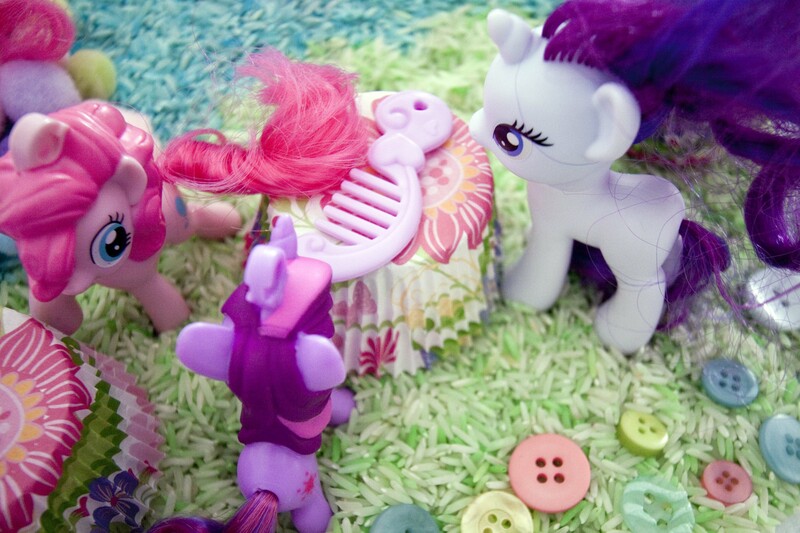 I added the brushes too, as the little girls love to comb the ponies’ manes and tails. 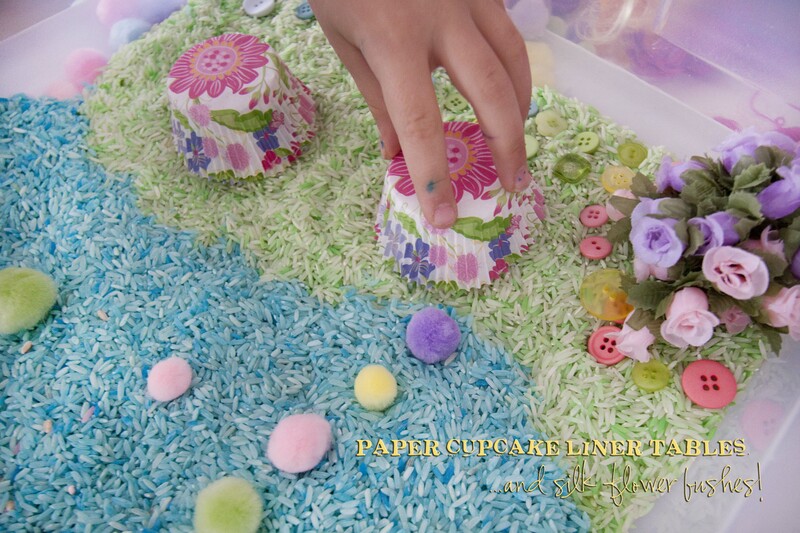 The toddlers like to turn the liners upright and fill them with pompoms and rice and then dump them out again. Once Coco is finished setting up, the toddlers get to have at it. And they love it. 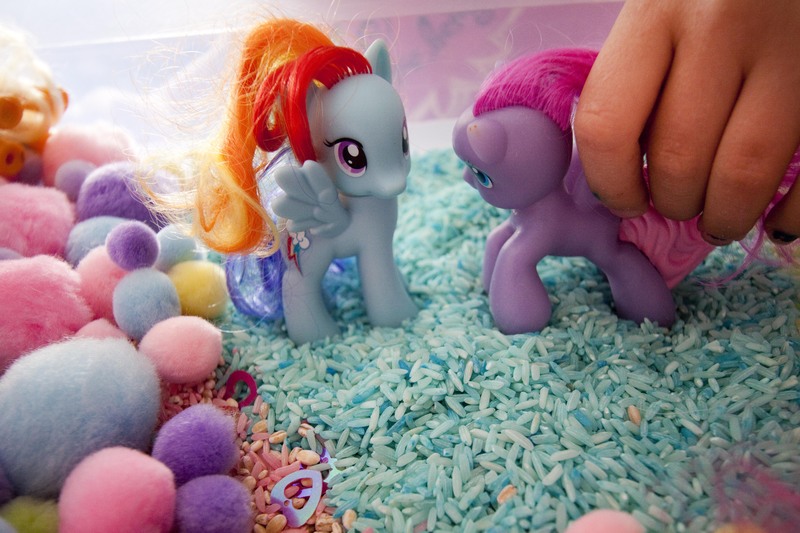 Filling, dumping, raining rice on the ponies, combing manes, and stomping hooves. All in all, a well-loved play bin for the girls here at my house. Even my 12 yr old couldn’t resist it for long! If you get a chance to treat the girls in your life to a little play world like this…do it! They will be busy for a looooong time. Probably long enough for you to grab a quiet cup of coffee or a meal that is actually still warm!!! 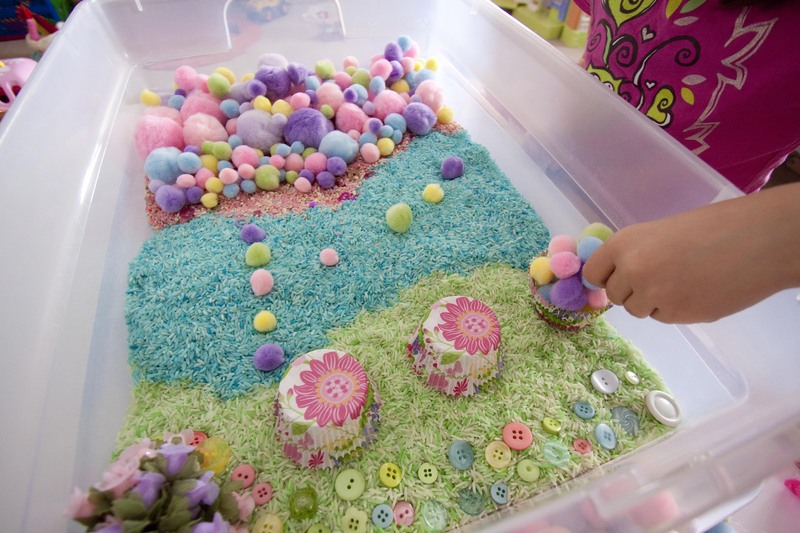 Merrin would love this…maybe I’ll make one with all of her Squinkies…a mini bin or something. Mini-bins are great! They fit under beds and travel well to hotels and holidays! Very fun small world, and so colorful! I think I’ll have to set this up for my daughter … so *I* can play with it! Love! 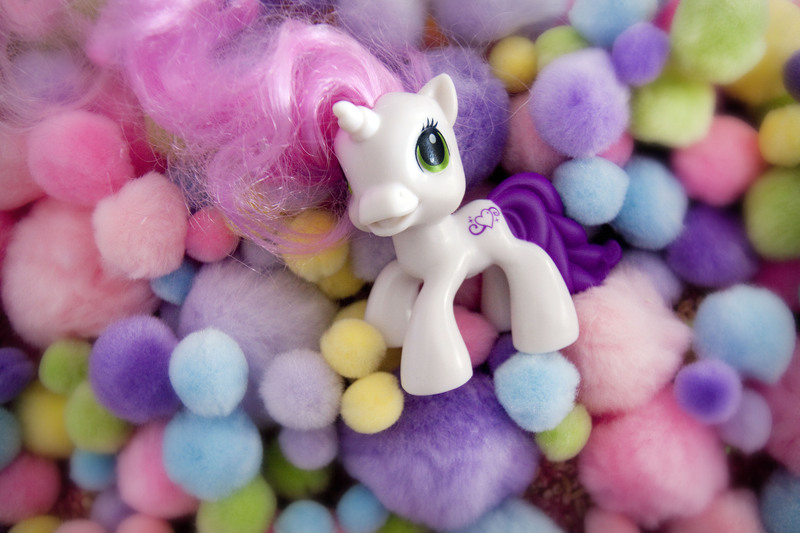 My daughter used to love My Little Ponies, but now claims she doesn’t anymore. This would be an inviting way to get her to play with them again. Need to do this with my girls – thanks for the idea! I did this last weekend for my daughter’s fifth birthday party. 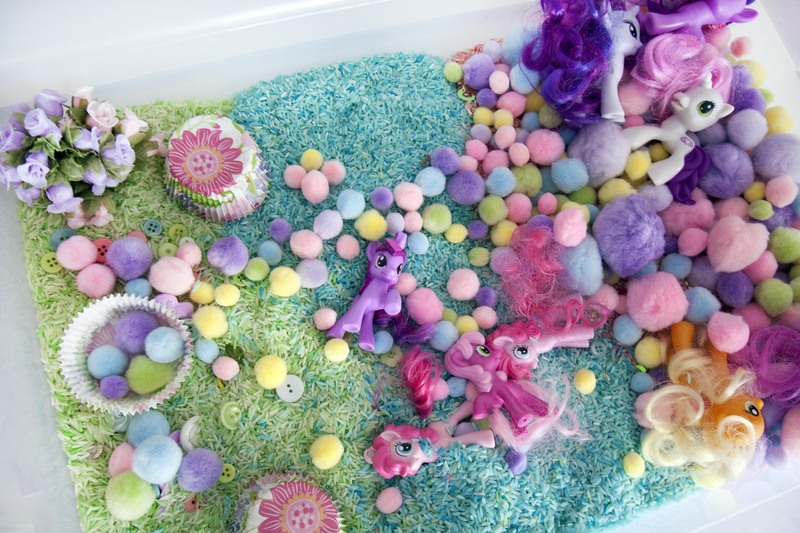 I used sparkly pompoms, cupcake liners, big plastic gems, flower-arranging glass pebbles (the last two were on clearance at Michaels, woo) — and of course a selection of my daughter’s ponies. It was a HUGE hit! All the girls, plus two little brothers, loved playing with it, and my daughter has been playing with it after the party, too. Thanks so much for the idea! !